Yellowstone National Park is hiring up to 400 employees in preparation for the 2018 summer season. Summer (June-August) is Yellowstone’s busiest time of year, accounting for the majority of visits to the park. According to Yellowstone spokeswoman Linda Veress, speaking to KULR8, the drive for hiring for the 2018 summer season has started now since seasonal workers can only be employed for six months. Last year, over 4.1 million people visited Yellowstone National Park. 2017 was the second busiest year on record for the park, following 2016, which saw nearly 4.3 million visitors. High visitation in recent years has prompted alarm from park officials over how park infrastructure like roads and parking lots are holding up. Indeed, a pair of visitor use and traffic studies released last year show that, if high visitation persists without meaningful investment made in park infrastructure, Yellowstone’s roads could become terminally poor by 2023. Currently, most roads in Yellowstone are closed for spring plowing. 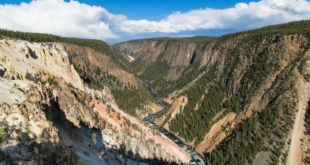 During this time, cars and other motorized vehicles are not permitted on park roads—with the exception of the road between Mammoth Hot Springs and Cooke City, which stays open all year. Select roads are also open to cyclists, as part of spring bicycling. Yellowstone roads will start reopening to cars Friday, April 20. You can see the full schedule here. The same day, select facilities will start reopening. You can see the full list of opening and closing dates here.